Is the form capable of linking to sperate pages on my website based on the options that are selected on the form? Yes, this can be made possible by using conditions. Take a look at this sample form for a demonstration. 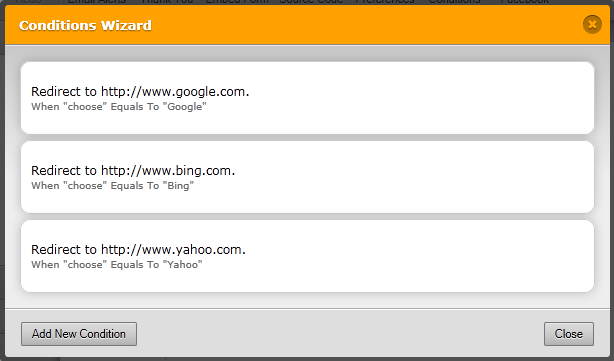 In this example, "Choose" is the name of my drop down field and the options are Yahoo, Bing, and Google. You can use almost any type of fields to determine which page to redirect to. 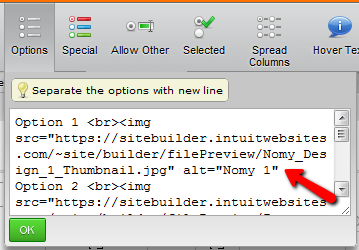 Note that redirect conditions, when triggered, will always override your Thank You page settings. Let me know if you have further questions regarding this solution. Thank you for using JotForm! Thanks Neil. I understand your response here, however I want it to apply to multiple conditions. For example: If the customer selects "50 books" from one dropdown menu and "100" pages from the second dropdown menu it would direct them to a different URL than if they were to select "50 books" and "50 pages." I hope that makes sense? Can you please advise how to do this? Your goal definitely makes sense, and is fairly easy to implement. Just add a new rule in your condition so that it will only trigger the redirect action when all or any of these rules are satisfied. In your case, you would need to have two rules in a condition and configure it to trigger only when both or all of them are satisfied. I am not sure but I think there is no cap as to how many rules you can add in a single condition. If I may suggest though, keep it as less as possible to optimize your form's performance. Hopefully this post answers your question. Feel free to ask for assistance if you're still having issues with conditions. Thank you! I think I figured out the answer to my question. However, I now realize that when I try to make the condition apply for Option 20 on my form - it automatically changes Option 20 to Option 1 on the conditions list. Not sure why this is happening. Can you please help? Your img tags inside the radio button options are unclosed. Try this fix then let us know how it goes. Thank you for your response. I added the /> the end of each Option and am still having the problem. It only seems to happen with Option 20. I include it in the options and it automatically changes it to Option 1 once I've left the edit page. Can you please advise further? In all likelihood, the reason why Option 20 is not working is because there's no space before the />. It's hard to pick out in the Options box but if you copy the code to Notepad or some other text editor, you'll immediately see that Option 20 is the only one missing that space. Please make the correction and let us know if it fixes the problem. Incidentally, I notice that none of the book cover images are currently being displayed. Kindly refresh your browser and access your form again. Thank you for using JotForm!